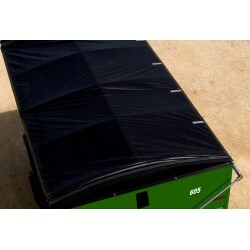 We offer Front-To-Back Quick Tarps in mesh or solid vinyl with 5 grommets on one end and a pipe pocket on the other end. 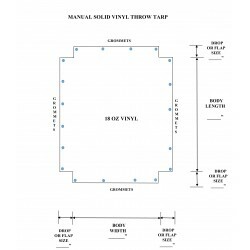 Side-To-Side roll tarps in a Strap Type style or Kwik-Lock Style that rolls up under the latch plate as well as Flat tarps in mesh or solid vinyl with grommets on the hem every 24” on all 4 sides. Trash Tarps with 2” webbing crisscrossing in an X pattern and sewn on the underside with loop ends. 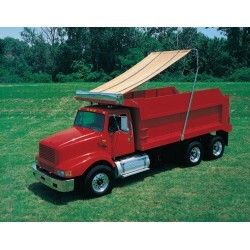 Manual Throw tarps with flaps and grommets on the hem and flaps every 24” for covering Grain Carts/Wagons and various Containers without installed tarping systems. Packer tarps in mesh or solid vinyl for covering openings on containers with grommets on all 4 sides to keep trash/debris inside during transport.